Georgia became a state January 2, 1788, the 4th state admitted to the Union. This city had several names before its incorporation in 1847, when residents approved the name “Atlanta.” Beginning as Terminus – so called because it was a point where the railroad route from Chattanooga would link to the Savannah route – it was later renamed Thrasherville for a merchant who had a store in the area, then renamed again as Marthasville in honor of the governor’s daughter. “Atlanta” is a shortened version of Atlantica-Pacifica, which was suggested by the Chief Engineer of the Georgia Railroad. 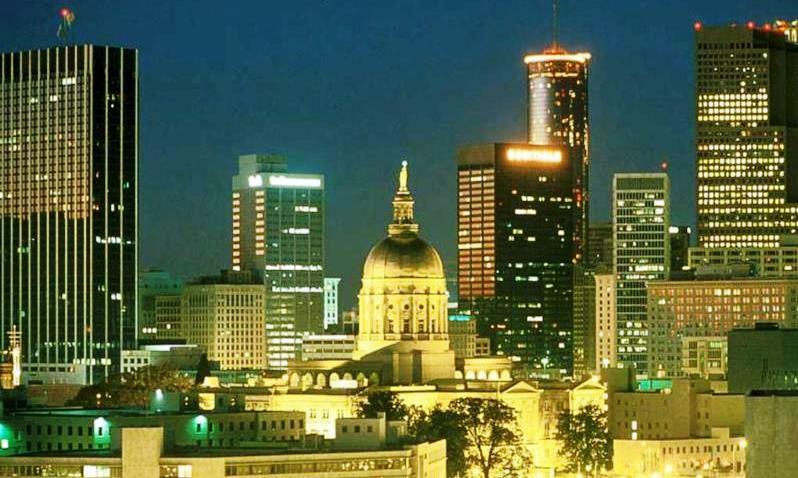 Atlanta did not become Georgia’s permanent capital until 1877. During the Civil War, it was burned to the ground, so it is a new modern city. The capitol dome is covered with gold that was brought by wagon from Dahlonega, site of the country’s first gold rush. Major sports teams in Atlanta are the Braves, Falcons and Hawks. Atlanta is home to CNN, headquarters for Coca-cola, and was host for the summer Olympics in 1996. President Jimmy Carter’s library is here, as well as the grave of Martin Luther King Jr. Stone Mountain and Six Flags are nearby attractions. The high-rise sparkle and the zillion things to do, the buzz, the moving ahead at lightning speed while dogwood quietly blooms, Clark Gable’s face on Cyclorama scenes, the food, the bragging rights for firsts, Coca-Cola, CNN. Mountains near: Blue Ridge, Appalachian, Stone Mountain monolith. Brasstown Bald, in the northeast corner of the state, is the highest point in Georgia at 4,784 feet.